Provide comfort for the family of Zachary Scott Fox with a meaningful gesture of sympathy. Zachary Scott Fox, 61, of Bloomington passed away on February 20, 2019 at Waters Nursing Home in Martinsville, IN after a two year battle with cancer. Born November 23, 1957 in Bedford, IN, he was the son of Hubert E and Anna Louise (Spires) Fox. He was a graduate of Bloomington High School North with the Class of 1976. 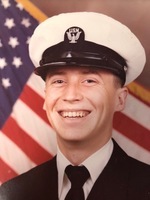 Zachary served six years in the United States Navy (1976 – 1982) as a Hull Technician. After that, he spent his years as a welder and doing odd jobs. He enjoyed being outdoors. He especially liked hunting for ginseng and morel mushrooms. Surviving are brothers Mark, Kevin and Tracy (Johnna) Fox of Bloomington; sisters Cherie Fox of Charlestown, IN, Denise Fox of North Carolina, Karen Fox of Fort Wayne, IN; Aunts Marilyn (Chet) Shively of Heltonville, IN and Marsha (Vern) Kirkman of Orleans, IN; and several nieces, nephews and cousins. He was preceded in death by his parents, grandparents and several aunts and uncles. His father died December 28, 1985. His loving mother died two weeks ago on February 06, 2019. Grandparents were Glen and Lucille (Byrd) Spires, Everett and Lucy (Cable) Fox. Graveside services will be at 11:00 A.M. on Monday, February 25, 2019 at South Union Cemetery in Bloomington with John Robertson officiating and Military Rites from the Monroe County Veteran's Honor Guard. In lieu of flowers family requests memorial contributions be made to the Family or to The Funeral Chapel, 3000 E. Third St, Bloomington, IN 47401. We encourage you to share your most beloved memories of Zachary Scott here, so that the family and other loved ones can always see it. You can upload cherished photographs, or share your favorite stories, and can even comment on those shared by others.